"It's our duty to remember!" Yesterday Karin von Welck, Senator for Cultural Affairs, inaugurated a monument as a tribute to the memory of Jehovah's Witnesses who were inmates of the Neuengamme concentration camp. 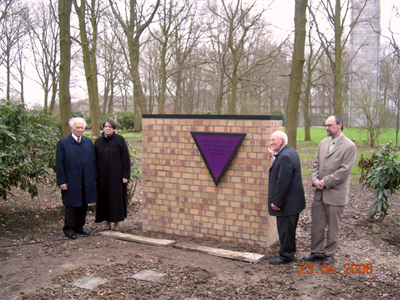 Witali Kostanda (left) and Richard Rudolph (right), survivors of the Neuengamme concentration camp with Senator Karin von Welck and historian Detlef Garbe, director of the Camp Memorial.